Finally, after a gray and rainy winter, the clouds have parted, the sun is shining, and it's time for Dodger baseball. 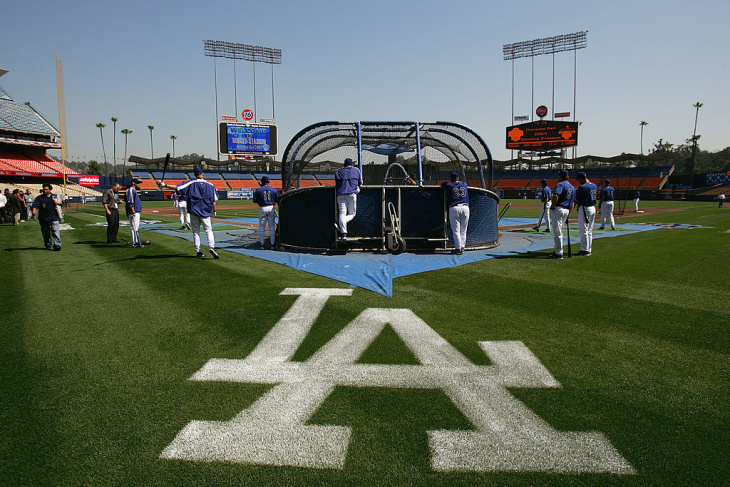 The back-to-back National League champions are back at Chavez Ravine Thursday, facing the Arizona Diamondbacks as the Major League Baseball's regular season begins. Whether you check out during the off-season, or spend the months feverishly following the news, here are a few things to know about today's game, some changes at the stadium and a bit about how the Dodgers are looking. Coming to #OpeningDayLA? Here's everything you need to know. Pregame activities: Dodger Stadium opened at 10 a.m., with pregame events beginning at 12:30 p.m. There are a number of Opening Day ceremonies planned, including a celebration of Dodger great Don Newcombe, who died in February at 92. The legendary pitcher was a Rookie of the Year, four-time All-Star, Cy Young Award winner and Most Valuable Player. Beginning Opening Day, Dodgers players will honor "Newk" this season with a commemorative patch on their jerseys with his number, 36. The first pitch is set for 1:10 p.m., and it'll be thrown by Hyun-Jin Ryu, who'll make the first Opening Day start of his MLB career. Clayton Kershaw won't be starting Opening Day for the first time in eight seasons. The Dodger ace is sidelined with shoulder issues and will start the season on the 10-day injured list. Fellow starting pitchers Rich Hill and Walker Buehler are also recovering from injuries, though Buehler is expected to start against Arizona on Sunday. Some familiar faces left in the off-season and there are a few new ones you'll see in the dugout. Most notably, Matt Kemp, Yasmani Grandal and Yasiel Puig are gone. The Dodgers acquired Red Sox pitcher Joe Kelly, catcher Russell Martin from the Toronto Blue Jays and outfielder A.J. Pollock from the Diamondbacks. You can check out the full roster here. The team is looking look to avoid a third straight year of heartbreak. The Dodgers have been a hot team for the past several years, making the playoffs for the past six seasons straight.. And with two consecutive National League pennants and World Series appearances (losing to the Houston Astros in 2017 and Boston Red Sox last year), Dodger Nation is hoping that the third time's the charm. Dieter Ruehle will also be a returning starter this season — behind the organ. This is his fourth year filling Dodger Stadium with ballpark classics, plus a healthy serving of '80s tunes, film and TV show scores, and even some retro video game themes. Reminder: he might take your song requests on Twitter. You won't be getting plastic straws at Dodger Stadium anymore, a Dodgers spokesperson confirmed to LAist. To comply with a recent Los Angeles city ordinance, vendors at the stadium have eliminated plastic straws, opting instead for "recyclable drinkable lids" on all beverages. Paper straws will be available upon request. To learn about parking at the stadium, you can view the lot map here. and buy your parking permit in advance here. And heads up for anyone looking to park in neighborhoods near the stadium: the city has announced parking restrictions for Opening Day, including some no stopping zones and two-hour restrictions on some residential streets. Avoid the traffic and parking problems by going Metro. Trust us: it's so much easier to load your TAP card and take Metro rail to Union Station, then hop on the Dodger Stadium Express bus, which is free for game attendees. You'll get dropped off closer to the stadium gates than most. Fans from the South Bay can board at several Metro stations in the area (learn more here). Happy #OpeningDayLA! Dodger Stadium Express is ready to roll. Buses run from Union Station and Harbor Gateway for every home game.